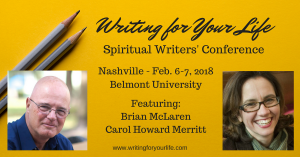 Writing for Your Life welcomes you to Belmont University for our second annual Writing for Your Life Spiritual Writers’ Conference! The conference is open to all who are interested in spiritual writing. It includes popular Christian authors and representatives from the Christian publishing industry. The main conference will take place on February 6-7, 2018, with an optional post-conference DigDeeper Retreat (separate registration required) on February 8. Attendees are also invited to attend the Faith & Culture Symposium events on Monday evening February 5 (Brian McLaren and various songwriters). See the Conference Schedule for further details. The conference and retreat will take place at the beautiful Janet Ayers Academic Center on the campus of Belmont University. Headline speakers for the event are Brian McLaren and Carol Howard Merritt. Breakout sessions with: Andrew Peterson (author and musician), Patricia Raybon (author and consultant), Jennifer Grant (author and consultant), Mihee Kim-Kort (author). David Dark (author and professor), River Jordan (author), Ami McConnell (editor and consultant), Daisy Hutton (HarperCollins), Joe Iovino (United Methodist Communications) and Sharon Wilharm (screenwriter). You can learn more about each speaker through the links below. Early-bird tuition for the main conference is $325, extended through January 8, and includes all General Sessions and Breakout Seminars, lunches, snacks and beverages during the breaks, one-on-one meetings, and an open-mic evening session. After January 8 tuition will be $349.